Wireless HDMI (High-Definition Multimedia Interface) systems offer you the ability to capture, transmit, and remotely view video broadcasts without the need for cables. Consisting of wireless HDMI transmitters and receivers, these systems are ideal for video producers and filmmakers seeking flexibility in camera positioning. They're also popular for use in surveillance systems where you can position security cameras anywhere. What Are the Benefits of Wireless HDMI Systems? By using wireless HDMI transmitters and receivers, video producers can avoid costly and time-consuming cabling. Moreover, cabling can be difficult, owing to long distances and obstacles such as walls, fences, ceilings, groups of people, and so on. In fact, in certain situations, going wireless is the only viable option. Another big plus is that the lack of cables also contributes to the safety of studios and other locations. While storing the recordings on internal storage such as memory cards is one option, producers and others often require real-time viewing of the video footage. 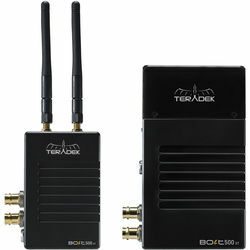 At the same time, these wireless TV transmitters offer camera operators freedom of movement and ease of repositioning. What Is a Video Transmitter? Wireless HDMI transmitters are professional camcorder and cine camera components that work to broadcast video output from a camera to an HDMI video receiver, which outputs the stream to a monitor, recorder, or portable device such as a tablet. Most transmitters offer a choice of frequencies and signal types such as NTSC, PAL, and SECAM. One key component is the camera control unit (CCU), which works to power the camera and handle the signals. It also allows remote control of certain camera settings for hands-free use. Other features of HDMI video systems can include a consumer electronics control (CEC) to allow control from afar by using remote control protocol (RCP). By using professional video RCPs and accessories, operators can use CEC-enabled televisions to control devices via MHL (Mobile High-Definition Link). How Does a Video Transmitter Work? 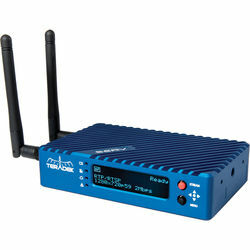 Wireless video transmitters take the output from a video camera and broadcast it to a base station. Wi-Fi is the most common way to transmit data. This is very convenient, as items such as tablets already have it. Another option, which is useful for transmitting over shorter distances, is to use Bluetooth adapters. However, many high-end systems employ microwaves, which can easily pass through various obstacles such as walls, and they ensure a more stable signal. This is especially important for the massive data transmission requirement of high-definition video. What is a Video Receiver? HDMI receivers take the signal from the transmitter and output it to the base station. Transmitters and receivers often come as sets. If the signal goes through as Wi-Fi, you can use any compatible device such as a laptop PC or smartphone as a receiver. Discover a high-quality line of wireless HDMI transmitters and receivers, and a complete range of professional video CCUs and base stations at B&H Photo and Video.